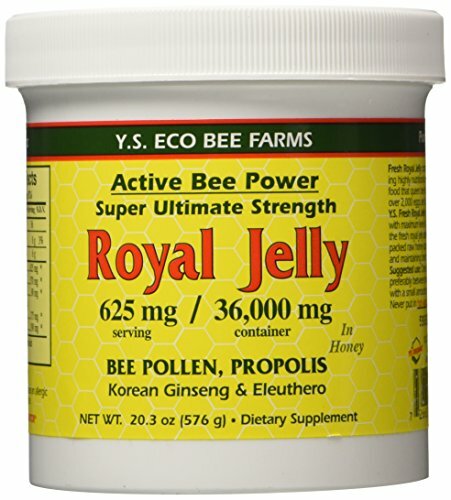 Fresh Royal Jelly in honey base contains life forming highly nutritional complexity of natures super food. Ys Organic, Pure Royal Energizer: 40,000 Mg Fre 21.0 Oz. 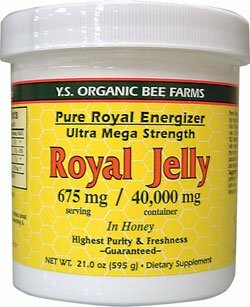 Pure Royal Energizer Ultra Mega Strength 675 mg Serving/40,000 mg Container Highest Purity & Freshness Dietary Supplement Fresh Royal Jelly contains life forming highly nutritional complexity of nature's super food that queen bee feeds on and incredibly lays over 2,000 eggs per day. Y.S. Fresh Royal Jelly has a superior beehive quality with maximum level of 10-HDA. It is vital to preserve the fresh royal jelly safely by blending with energy packed raw honey capable of naturally crystallizing and maintaining the thick consistency. Y.S. Beekeepers of generations are serious about Certified Organic Bee Farming, researching & leading the world to organic. 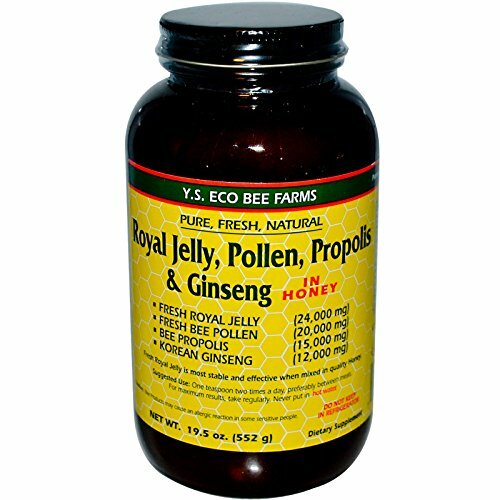 Royal Jelly 200 mg Ginseng (Siberian 200mg, Korean 100mg) 65 CapsuleSuggested Use As a dietary supplement As a dietary supplement, take one capsule once or twice a day or more as needed, preferably between meals - Or as directed by your healthcare professional.Supplement FactsServing Size: 1Servings Per Container: 65Amount Per Serving% Daily Value***Royal Jelly (freeze dried 3.5x)250 mgKorean Ginseng (root)150 mgEleuthero (root)100 mg***Percent Daily Values are based on a 2,000 calorie dietOther Ingredients: Gelatin, Magnesium, StearateWarnings: Keep out of reach of children. As with all dietary supplements, consult your healthcare professional before use. See product label for more information. Bee products may cause allergic reactions in some people. Due to honey content, not recommended for children under two. 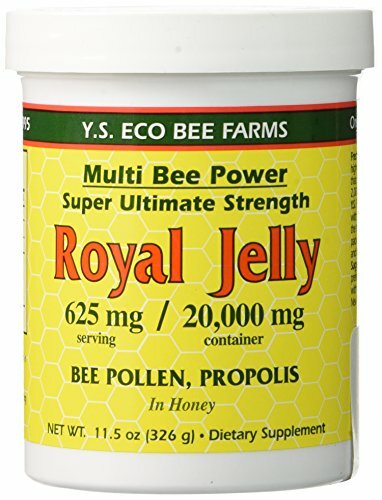 100% Pure Ultra Mega Strength Royal Jelly contains life forming highly nutritional complexity of nature's superfood that queen bee feeds on and incredibly lays over 2,000 eggs per day. Storehouse of naturally occurring nutrients: full array of B-Vitamins, essential amino acids, fatty acids, phytosterols, enzymes, acetyl choline, gamma globulin, lecithin, natural hormones, 10-HDA, catalystic factor "R" and many more. Pioneer in Organic Active Bee Power Super Ultimate Strength 625 mg Serving 36,000 mg Container In Honey Bee Pollen, Propolis Korean Ginseng & Eleuthero Dietary Supplement Fresh Royal Jelly contains life forming highly nutritional complexity of nature's super food that queen bee feeds on and incredibly lays over 2,000 eggs per day. Y.S. Fresh Royal Jelly has a superior beehive quality with maximum level of 10-HDA. It is vital to preserve the fresh royal jelly safely by blending with energy packed raw honey capable of naturally crystallizing and maintaining the thick consistency. 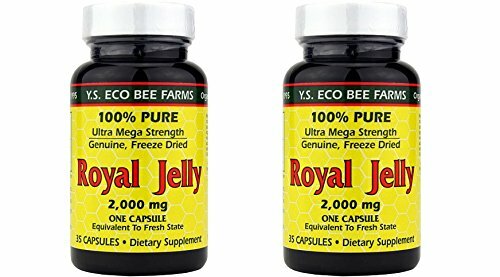 Fresh royal jelly contains life forming highly nutritional complexity of nature's super food that queen bee feeds on and incredibly lays over 2,000 eggs per day. YS Fresh royal jelly has a superior beehive quality with maximum level of 10-HDA. It vital to preserve the fresh royal jelly safely by blending with energy packed raw honey capable of naturally crystallizing and maintaining the thick consistency. 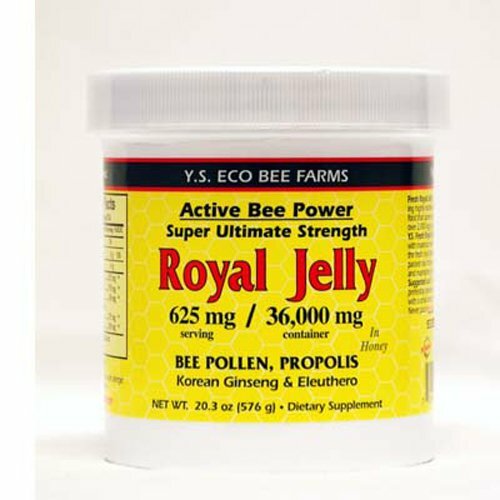 Fresh Royal Jelly + Bee Pollen Propolis Ginseng Honey Mix - 6 000 mg by Y.S. 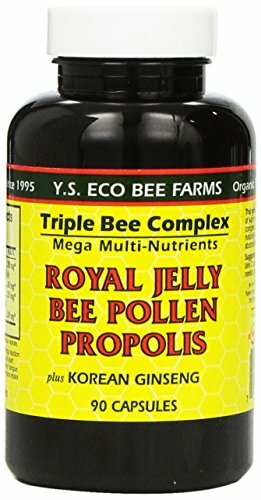 Organic Bee Farms 5.6 oz Liquid Fresh Royal Jelly Bee Pollen Propolis Ginseng Honey Mix - 6 000 mg 5.5 oz Liquid Supplement Facts Serving Size 1 Teaspoon (10 g) Amount Per Serving Daily Value Calories 36 Carbohydrates 8 g 3 Sugars 6 g Royal Jelly 625 mg Bee Pollen 570 mg Propolis 180 mg Eleuthero 175 mg Korean Ginseng (Root) 190 mg Percent Daily Values are based on a 2 000 calorie diet Warnings Keep out of reach of children. As with all dietary supplements consult your healthcare professional before use. See product label for more information. 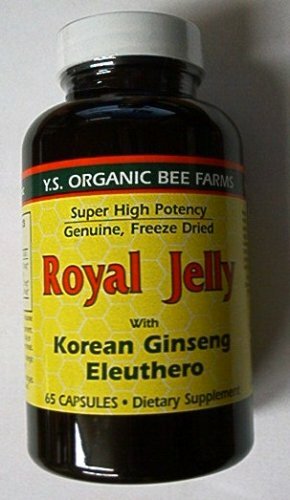 Royal Jelly for fertility..What I think.. 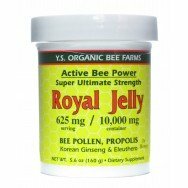 Looking for more Ys Organic Royal Jelly similar ideas? Try to explore these searches: Hp cb383a Magenta Toner, Rotisserie Forks, and Classic Herringbone Laptop Tote. Shopwion.com is the smartest way for comparison shopping: compare prices from most trusted leading online stores for best Ys Organic Royal Jelly, Facial Massage Brush, Leather Visitors Guest Chair, Organic Jelly Ys Royal . 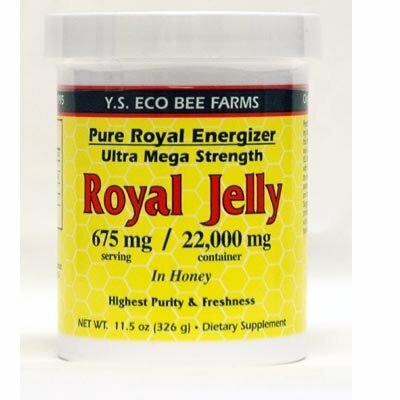 Don't miss this Ys Organic Royal Jelly today, April 24, 2019 deals, updated daily.